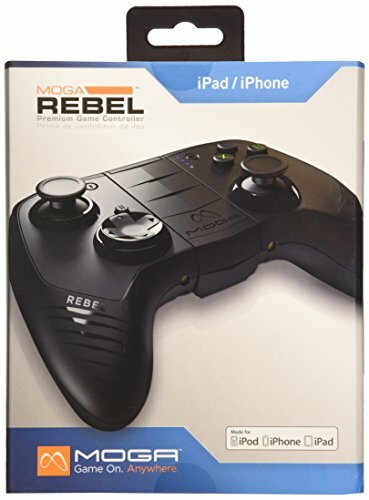 Product Description from Manufacturer: A Premium Gaming Experience The MOGA REBEL elevates your mobile gaming experience. The game titles offered on iTunes are evolving beyond poke and swipe and the REBEL is there to meet the challenge. Designed with most exacting standards and built with the finest components, gaming with the REBEL must be experience to be believed. Play on All Your Apple Devices The MOGA REBEL's unique design makes it the perfect mobile controller for both iPads and iPhones. The REBEL connects wirelessly via BluetoothTM so you can set up your iPad, iPad Air or iPad Mini on a stand and play from the comfort of a chair. Or use the S.M.R.T. LockTM arm to secure your iPhone 6, iPhone 6 Plus, iPhone 5s, iPhone 5c, iPhone 5 or iPod Touch (5th Generation) and play on the go. Ready for Your Upgrade MOGA's S.M.R.T. Lock technology transforms your iPhone or iPod Touch into a portable gaming system. A spring-loaded arm and cushioned rubber tabs secure your phone to the controller. The arm even adjusts over 3.75 inches to accommodate anything the future has in store. Great Games Hundreds of iOS games have been controller enabled, including amazing titles like the original BioShock by 2K. Go to the MOGA games page or check out the MOGA World App to see some of the best titles available. As any MFi controller, only game that supports controller is playable by controller, check above before you order. If you have any questions about this product by MOGA, contact us by completing and submitting the form below. If you are looking for a specif part number, please include it with your message.